The bear attacked the handler after "losing understanding" with him, a spokesperson said. A circus bear lunged at his handler during a routine show in front of a group of children. 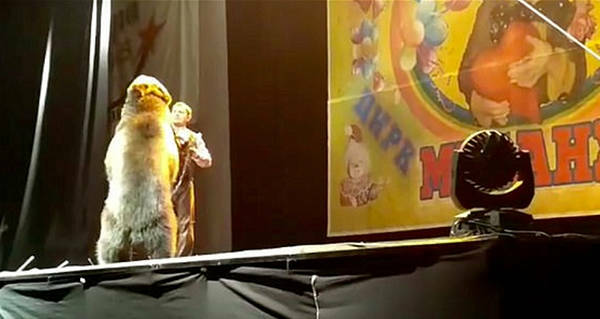 The bear, a performer for the Melanzh Circus troop, was walking on its hind legs and doing turns, when suddenly it lunged at its handler. The handler, who was standing off to the side of the stage, was knocked to the ground as the bear stood over him. Luckily, a quick-thinking assistant hit the bear with a stick, causing him to get off of the handler. The handler then stood up and began feeding treats to the bear, who then continued performing. In the video, the audience can be heard crying out during the short attack, but the handler made sure to demonstrate that he was unhurt and that the bear was okay as well. Later in the show, the handler even knelt in front of the bear and gave him a hug. Oleg, a representative for the circus told a local newspaper that the attack was simply a misunderstanding. The attack has once again raised the long-standing issue of keeping wild animals in captivity for entertainment purposes. Many people believe that animals belong in the wild, and many experts have been quick to point out the dangers of keeping a wild animal in a pen. Over the years there have been hundreds of examples of “tame” wild animals attacking their handlers. In 2010, a SeaWorld trainer named Dawn Brancheau was fatally dragged underwater by a killer whale during a routine show, causing uproar nationwide about the treatment of whales in captivity. The protests and outrage ultimately prompted SeaWorld to end their orca whale breeding program. In 2002, Roy Horn, one half of the entertainer duo Sigfried & Roy, was mauled by one of his white tigers while on stage in Las Vegas. Though he survived the attack, Horn suffered partial paralysis and a long recovery. He now advocates for conservation research and does not perform with the cats any longer. Finally, last year, the Ringling Brothers and Barnum and Bailey Circus was forced to shut down, after activists called for the removal of their signature elephants from the show. The elephants now live on a conservation reserve. Next, read about how the Ringling Brothers were forced to close their doors. Then, watch the video of a drunk Russian man who tried to feed a bear, and got his arm bitten off.